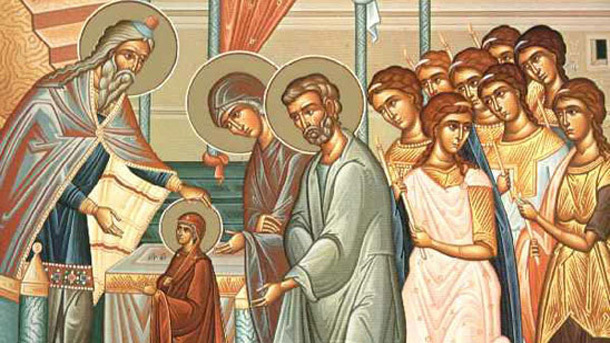 On November 21, the Orthodox Church celebrates the Feast of the Virgin. According to the Scriptures of this day, the parents of the three-year-old Mary brought her to the Temple of Jerusalem and gave God a ministry. The priests and ministers in the temple welcomed them with the singing of sacred hymns. Our Lady is placed on the first step in front of the temple entrance, and to the astonishment of everyone present, unsupported by anyone, she climbed freely through the 15 steps and stood on the top. High Priest Zechariah introduced the blessed Otrokovitsa in the Holy of Holies, where only the high priest entered once in the year. The righteous parents brought gifts and sacrifices to God, and then, having received a blessing from the priests, returned with their relatives to Nazareth. Our Lady lived at the temple. She has been educated under the supervision of older pious girls who know Holy Scripture. The church calls it "a wonderful dawn," from which the sun of righteousness rose.When the virgin Virgo reached the age at which the virgins who were educated at the temple usually returned to the world and married, the priests asked her to do the same. But Mary revealed their desire to dedicate herself to God and not marry. Then, on the suggestion of St. Spirit, betrayed her to the old Joseph, a relative of her parents. He became the patron saint of Mary and respected the vow that she gave to God. November 21 was also adopted as the Day of the Christian Family. The earliest announcement of the celebration is from the end of the 1st century. Nowadays, family walks into a church symbolizes Mary's three-year entrance to the temple and reminds fathers and mothers of their spiritual duties to the children. Because the family is the best school that can give the first knowledge of God and Orthodoxy, of the Christian virtues that the Bulgarian family has for centuries. Presented to God, children will grow godly in obedience to their parents and purity of manners.In the past, this day has been celebrated in a very limited circle - only with the parents and those of their children who have not married. They all went together to the temple to pray for their family's health and favor. Then in the house, gathered around the fireplace, a glass of wine, hot cakes and delicious dishes, celebrating - besides the Feast of the Virgin - the good connection with each other. The mass left untold for the Virgin to come in the night to eat and bless the house. On this day, our people guess what the weather will be throughout the next year. If it is warm and sunny - winter will be hot, summer will be dry, and fertility poor. If it rains or snow, the winter will be snowy, summer - rainy, and the harvest - rich.